Akil, O. and Lustig, L. R. (2013). Mouse Cochlear Whole Mount Immunofluorescence. Bio-protocol 3(5): e332. DOI: 10.21769/BioProtoc.332. This protocol comprises the entire process of immunofluorescence staining on mouse cochlea whole mount, starting from tissue preparation to the mounting of the tissue. This technique provides “three-dimensional” views of the stained components in order to determine the localization of a protein of interest in the tissue in its natural state and environment. Rabbit anti-myosin VIIa antibody (a hair cell-specific marker) (Proteus Biosciences, catalog number: 25-6790 ) at a dilution of 1:50 in blocking buffer. Cy2-conjugated Goat anti-rabbit secondary IgG antibody (Jackson ImmunoResearch) at a dilution of 1:4,000 in PBS. Cy3-conjugated Goat anti-guinea pig secondary IgG antibody (Jackson ImmunoResearch) at a dilution of 1:4,000 in PBS. Note: secondary antibodies should be diluted in PBS (not blocking buffer). DAPI to counterstain nuclei (1.5 μg/ml in PBS) (Sigma-Aldrich, catalog number: D9564 ). Anesthetize mice (mice overdosed with 200 μl of a mixture of ketamine hydrochloride, 100 mg/ml and xylazine hydrochloride 10 mg/ml, per 100 g of mouse weight). Pinch the toes to check if the animal is fully asleep then decapitate the mouse. Cut the mouse head in half. Hold head on side so the 'bowl' of the skull is facing up. The temporal bone is in the back and is not continuous to the skull (there are many small bones attaching it to the skull). Push in the junctions between the skull and the temporal bone (away from the cochlea area) to break it away from skull. Carefully dissect extraneous bones away from the cochlea. The following video by Parker et al. 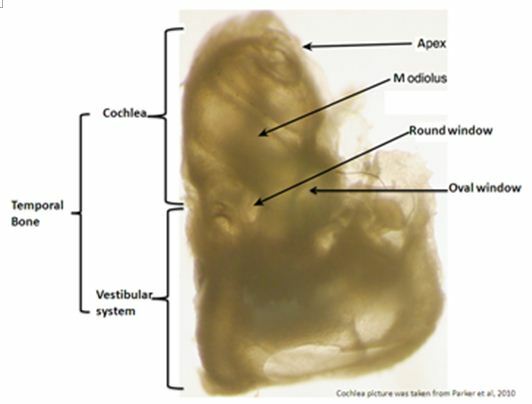 (2010) shows, between min 3 and 4, how to dissect the temporal bone (cochlea) from a P3-5 mouse. The same procedure is done for an older mouse, but the only difference is the bone cochlea becomes harder. 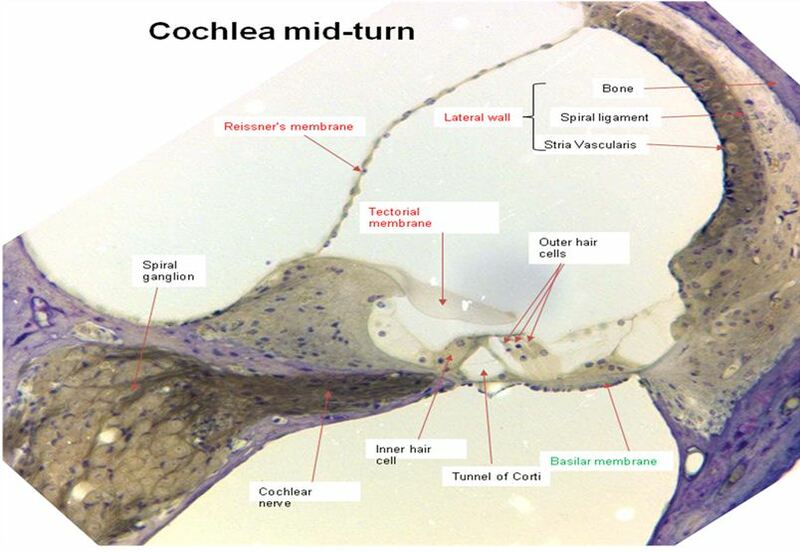 Use a syringe to push approximately 0.5 ml of ice cold 4% PFA-PB through the round and oval windows (RW and OW) after having made a small hole in the apex of the cochlea (for orientation refer to the whole cochlea picture with legends in Figure 1 (Glen et al., 2008)). Figure 1. Shows a mouse decalcified left temporal bone. This labeled picture helps for orientation on the mouse anatomy of the whole temporal bone needed for good success in reproducing this protocol [this picture was borrowed from MacDonald et al. (2008) paper]. Note: To have a very good fixation, the round window membrane should be punctured and the stapes should be removed before cochlea perfusion. Post-fix the cochleae in 5 ml 4% PFA-PB for 2 h at 4 °C under gentle agitation. Using 1 ml syringe rinse cochlea by perfusing 3 times PB through the RW and OW. Wash 3 x 15 min in fresh PB at 4 °C under gentle agitation. Transfer the cochleae to 5 ml tube containing 5% EDTA and incubate at 4 °C under gentle agitation. Note: Before going to next step, you need to check if the cochleae are very well decalcified. Insufficient decalcification will not help to get an intact and good organ of Corti. A good decalcification is when the cochleae become soft at touch with forceps and when the cochlea bone becomes transparent. A picture of decalcified cochlea is present in the following video. 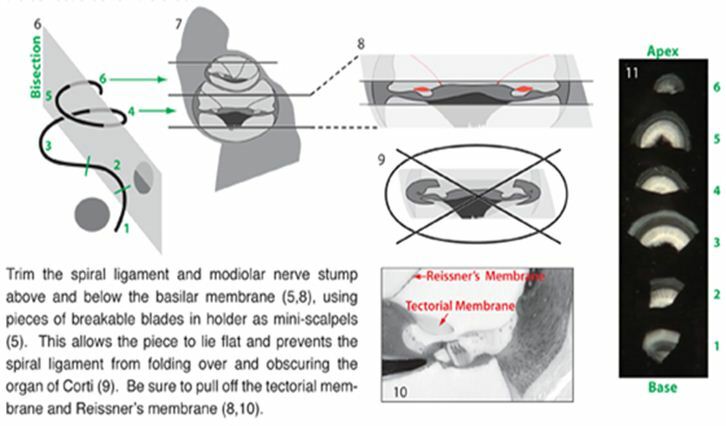 The otic capsule, the lateral wall, Reissner’s membrane and tectorial membrane should be removed in that order and then dissect the organ of Corti (for orientation on the cochlea anatomy see the cochlea mid-turn cross section Figure 2). Figure 2. Shows a mid-modular cross section of the mouse cochlea turn stained with toluidine blue. This labeled 20x view section helps for orientation on the mouse cochlea anatomy needed in this protocol for good success in reproducing this protocol. The remaining organ of Corti was further dissected into a surface preparation and microdissected into individual turns. dissection that better preserves the overall structure of the organ of Corti. Microdissected cochlea individual turns were then placed in a 0.5 ml Ependorf tube cap containing blocking buffer and incubated for 1 h at room temperature (RT) on a rocking platform. Incubate in primary antibodies diluted in blocking buffer overnight at 4 °C on a rocking platform. Note: Putting the cap with cochlea turns in a small Petri dish and wrapping them with parafilm will prevent dehydration. Rinse 3 x 15 min in PBS. Incubate with secondary antibodies in PBS for 2 h at RT on a rocking platform. Note: Because the secondary antibodies are sensitive to light, the tissue should be wrapped with aluminum foil to protect it from light. Rinse 3x 15 min in PBS. Stain the nuclei with DAPI in PBS for 15 min at RT. Mount the cochlea whole mount turn carefully onto slides. Note: The orientation is very important in mounting the whole mount organ of Corti. The hair cells stereocilia should face up and be in contact with the coverslip, while the basilar membrane labeled green in Figure 2 should be on the bottom and be in contact with the slide. The video of Liberman's laboratory shows the correct orientation of the cochlea surface preparation a slide of the video is presented in Figure 3. Figure 3. Shows a slide of the video of Liberman's laboratory. “http://www.masseyeandear.org/research/ent/eaton-peabody/epl-histology-resources/video-tutorial-for-cochlear-dissection/” presenting the correct orientation and preparation of the whole mount organ of Corti. The hair cells stereocilia should face up and be in contact with the coverslip, while the basilar membrane labeled green in Figure 2 should be on the bottom and be in contact with the slide. At this step if the orientation of the cochlea surface preparation is done properly it provides very good views of the stained components under the microscope. Apply a drop of antifades solution, coverslip and then let it dry. Slides are now ready to be observed under a microscope equipped with epifluorescence. Note: For better images use a confocal immunofluorescence microscope and do not expose your slides too much to light to avoid stain bleaching. Figure 2 in Akil et al. (2012) Neuron paper is a sample of the Mouse Cochlear Whole Mount Immunofluorescence. We acknowledge the support of this work by Hearing Research Inc and NIH R21 DC012118-01. We thank Neuron Journal and the Mass Eye and Ear for some illustrating images we used in this paper. Akil, O., Seal, R. P., Burke, K., Wang, C., Alemi, A., During, M., Edwards, R. H. and Lustig, L. R. (2012). Restoration of hearing in the VGLUT3 knockout mouse using virally mediated gene therapy. Neuron 75(2): 283-293. MacDonald, G. H. and Rubel, E. W. (2008). Three-dimensional imaging of the intact mouse cochlea by fluorescent laser scanning confocal microscopy. Hear Res 243(1-2): 1-10. Parker, M., Brugeaud, A., Edge, A. S. B. (2010). Primary culture and plasmid electroporation of the murine organ of corti. J Vis Exp (36) e1685. How to cite: Akil, O. and Lustig, L. R. (2013). Mouse Cochlear Whole Mount Immunofluorescence. Bio-protocol 3(5): e332. DOI: 10.21769/BioProtoc.332. We forgot to rinse our samples that had been in PFA with PBS before adding the EDTA to decalcify. Do you think this will make a big difference to our samples? And if so, do you know of anything we can do to fix the problem? If you forgot to rinse your samples from PFA there will be no negative effect to your samples. For your information some protocols use 1% PFA with EDTA when decalcifying. I can not see the video, would you please kindly share it to me? Thanks for your interest to our protocol. The video was on the Massachusetts Eye and Ear web site but it looks like they removed it.